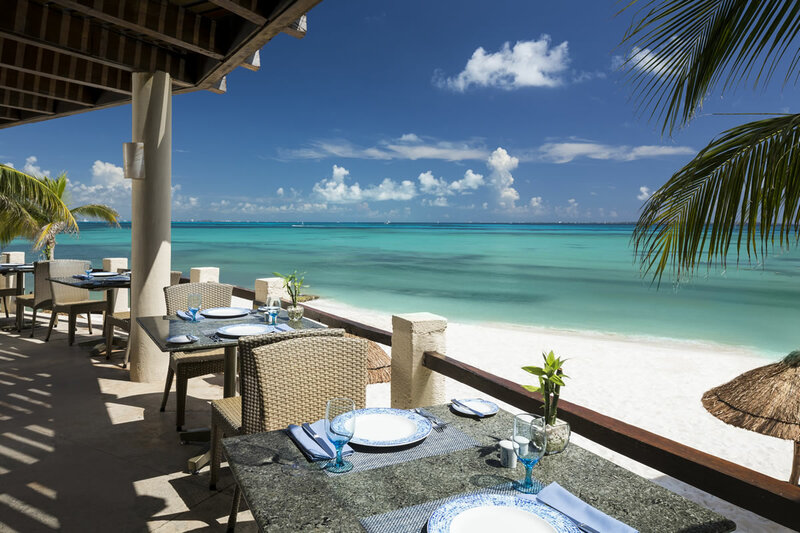 If the sound of splashing waves and the tranquility of soothing turquoise waters appeals to you – especially while dining – then think no more and head for the beautifully situated Isla Contoy Restaurant. The perfectly placed huge palapa by the sea is the venue not only for its unspoiled panorama, but for an array of delectable dining options for both lunch and dinner. Whether you opt to dine on the terrace, or under the shade of the majestic palapa, the scenery is picture-perfect from every angle. The host of tempting menu selections offers everything from cool appetizers such as shrimp cocktails, ceviches and sushi, to crispy salads and savory soups as well as other favorites highlighted by hamburgers and quesadillas as well as sizzling steak, chicken and seafood entrees. By day, spectacular seaside views extend as far as the eye can see to the mystical Isla Mujeres. When the sun goes down the vibe is definitely romantic with the soft touch of candles and soft music casting a glow on scene. Seafood highlights include: grilled salmon filet with truffle risotto and vegetable fricassee; citrus-crusted filet with savory orange creamy spinach and saffron sauce; sautéed mahi mahi with artichokes and olives, and seared tuna served with cucumber and cherry tomato salad, red wine sun dried tomatoes and black olive sauce. The seafood platter for two features a selection of: shrimp, lobster tail, scallops, mussels, calamari and mahi mahi. Selections for meat lovers include: Angus beef burgers, grilled flank steak with Mexican rice and fresh guacamole; rib eye with spicy roasted potatoes and beets, or short ribs with maple syrup, spices, roasted garlic mashed potatoes and asparagus. Additional menu options include pasta, quesadillas, fish or chicken tacos and fajitas. Wines, signature drinks and delicious desserts, of course add to the experience. A special treat after your meal is the Maya coffee ceremony. Prepared at a special buffet station, it’s made with Xtabentun – a liqueur made with anise and fermented honey culled from bees that feed on the Xtabentun flower. Sugar, and vanilla ice cream are added to the mix and it is flambéed at your table.